This is my article for the Got Loot? Festive Blogfest. In the spirit of Alton Brown abhorring unitaskers, this article also fits into the Schrödinger's Gun GMing series. The word "treasure" conjures images of dragons napping on piles of coins and loot. But what the heck is it actually good for? I've seen entire RPG books dedicated to the topic of treasure. A third of the original D&D 1e Dungeon Master's Guide contained random tables and descriptions dedicated to generating and describing the loot found by defeating monsters. The detail and variation of treasure can help immerse a player in the game's reality, but it can drive a GM to distraction. But here's the thing: There are only 3 types of treasure. I've found that thinking of treasure in terms of these three categories lets me know where to invest my time during prep. I used to detail every scrap of treasure the party found, but I don't do that any more and I'm much happier for it. This is a very concentrated application of Schrödinger's Gun GMing, so reading up on some of those ideas elsewhere in this blog would help fit this idea into the overall GMing approach. Traditionally, treasure most often associates with a fantasy setting, but these categories exist independent of setting. I think of treasure in terms of what it means to the characters and how it's used within the game. Things that the characters consider useful deserve attention, while anything that doesn't catch the character's interest might as well be a gift certificate with "1400 GP" scrawled on it. A Character Tool improves a character's abilities or adds capabilities. Spiffy weapons fall into this category, as does armor and utility items. In magical settings, scrolls containing the secrets of a new spell or ritual give your spellcasters new options. Hauling that jetpack around might seem silly to some, but when the party faces a 40-story jump suddenly everybody wants one. Story Keys have value within the context of the game's story. 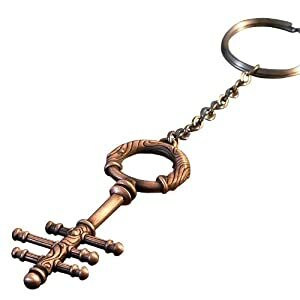 A Story Key usually manifests in a traditional Quest Item sense, where you need it to unlock the next scene of the story. Actual keys fit the bill, as do recovered family heirlooms, treasure maps, swords stuck in rocks that indicate kingship, and invitations to the masquerade ball. Story Keys may have little intrinsic value, but their value comes when they cause the story to progress. Non-physical treasure and experience also falls into this category. Knighthood raises the social level of a character and may lead to different adventures. Having the queen's ear may mean she calls on you for some sensitive tasks requiring deniability. Defeating Professor Moriarty once means you'll probably be the first call when he escapes. Collections and affectations manifest as Story Keys as well. If a character wants to collect one of every type of gemstone that exists for whatever reason, then gems have just become significant in your game. Furthermore you can use that quirk as a story hook. After all, what gem collector could resist exploring a dwarven mine, even if it's haunted by banshees? Valuable stuff encompasses every other scrap of treasure the party finds. It holds no intrinsic value to the characters nor the story, it just takes up space on a character sheet somewhere. Valuable Stuff is a catch-all category of loot which serves exactly one function: to be traded within the scope of the game for one of the other two types of treasure. You can have a room filled with gold candlesticks, but they have very little intrinsic value, and they're just taking up space. If you trade those candlesticks for ownership of a castle, you've just changed the world. If you name it Candlestick Castle, you've got a story that will persist for as long as the castle stands and as long as the players remember that game. You've taken wealth beyond numbers on a ledger and into immortal story. Here's a great illustration: the D&D 3.5 Windfall game was written up over at You Meet In A Tavern almost 5 years ago. It got its name because the characters salvaged an adamantine door from the ancient Cannith facility in The Forgotten Forge, so 2nd level characters had 200,000 gold pieces each at the end of the intro module. They hauled around platinum bars buying things, thus converting Valuable Stuff into Character Tools and a couple of great Story Keys in that Staff of Storms and a tavern later on. Hoarding didn't serve any useful purpose except attracting powerful NPCs intent on liberating that wealth, so they spent it on useful things. Money by itself isn't important. How you use it to change the world is. Loot can fall into multiple categories, and an item can shift categories as the game moves forward. For example, the party can uncover an ancient bronze dagger in a dragon's hoard. They have it identified and discover it's a +2 implement that gives a bonus when researching arcane or historical topics. The party Wizard claims it and uses it, so it's a Character Tool. Later, the Wizard discovers that the dagger has ties to an ancient culture that somehow controlled dragons into ferrying people across the Trackless Desert. The party uses the dagger to unlock the tomb of the dagger's creator, thus using it as a Story Key. In later years, the Wizard trades the dagger for an upgraded implement, treating it as merely Valuable Stuff. Here's how to save time with this approach. Under Schrödinger's Gun GMing there's no reason to define the story until the characters pay attention and bring it into their reality. One way to offer story hooks involves calling the characters' attention to a piece of treasure and letting them decide if they want to research its significance. You don't need an entire history written up when doing this. An odd feature should catch the characters' attention, especially something that makes them ask questions like, "Where would a group of evil monks get a goblet dedicated to a god of overindulgence that nobody worships any more?" If they want to start researching it, you've got a hook for your next adventure. If it doesn't catch their attention, you've spent maybe a minute coming up with an interesting description on its way to the Valuable Stuff pile. Another strategy in this vein involves adding significance to an otherwise anonymous Character Tool. For example, the characters could find a +2 spear painted with a red spiral down the shaft. They carry it into town where the guardsmen immediately recognize it as belonging to a beloved sergeant who disappeared while guarding a trade caravan. The person with the spear will certainly get special attention from the guards in town, and the only way to resolve that issue in the guardsmen's minds involves exploring the missing sergeant's story and figuring out what happened to him. I always try to keep a couple of description-worthy treasure items/story hooks handy to toss into a hoard. You never know when the players will need a break from the main plotline and want to explore the story spun from a bit of loot. Some of the best stories come from the players guessing at what you have planned, and all you need to say is, "Yes!" Feel free to use this approach to stop spending so much time worrying about rolling up Valuable Stuff and focus on fleshing out your party's story. If you try this approach, I'd love to hear how it works for you in the comments. See the other entries in the Got Loot? Festive Blogfest. Go to the Schrödinger's Gun GMing Cover Page.